Congee (rice porridge) – Asian comfort food great for babies. You can make it plain or get creative like this version. I haven’t posted new baby recipes for a while but a good friend finally motivated me to do so. She has been cooking the sweet potato porridge for her daughter and can’t wait for my new baby recipes. So, here is my deluxe baby porridge recipe that I have been making for Baby G since he was 7 months old. It’s called deluxe baby porridge because I have added many nutritious and delicious ingredients to the porridge: protein (you can use chicken, ground pork, fish, or beef), dried scallop (the secret ingredient in Chinese cooking that makes food extra yummy), silver fish or baby anchovy (which is loaded with calcium), potato (sweet potato or regular Russet potato or Yukon Gold), squash (I love pumpkin, kabocha, or butternut squash), vitamin C (tomato, broccoli florets, green beans, carrots), and onion. Onion has many medicinal benefits and stimulates good appetite. I also add an egg yolk towards the end of the cooking because Baby G doesn’t like formula. Believe it or not, Baby G has been eating this same porridge for over 6 months (he is now 13 months) and he never gets bored; in fact, he eats more and more each day because he is now an active walker! This recipe is very versatile because you can change the combinations I proposed above: use a different protein every day, change your potato, squash, and vitamin C and you have many variations. For me, the silver fish, dried scallop, and onion always stay because of the great flavors they lend to the porridge. Please take note that the dried scallops are quite expensive but if you do get it, buy the small dried scallops (slightly bigger than a dime), preferably from Japan. It’s hard to swallow so I always remove it from the porridge before I blend it. 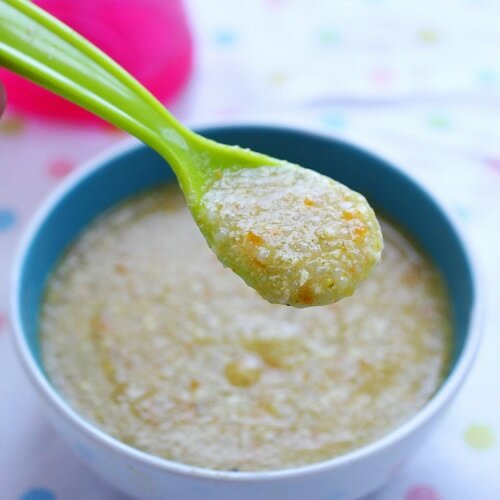 If you have never fed your baby all the ingredients in this recipe, always start by introducing one ingredient at a time until you’re sure that your baby doesn’t have any allergy reactions to the ingredients. As Baby G grows, I slowly introduce new ingredients to his porridge. His new favorite is corn kernel, which adds a subtle sweetness to the taste. So experiment with the recipe and find your baby’s favorite combinations. In any case, I can assure you that this porridge tastes very good, so much so you won’t mind eating it, too. Put the rice into a small pot and rinse with cold water a few times. Discard the cloudy water and add 3 cups of filtered water into the rice. Add all the ingredients into the pot and bring it to bowl on medium heat. Lower the heat to simmer, cover the pot, and let cook for 45 minutes or until the rice breaks down completely. If using egg yolk, lightly beat the egg yolk and add to the porridge. Stir a few times, and let cook for about 1-2 minutes. Before serving, remove the dried scallops (you can eat them) before using a blender to puree the porridge. Serve it cool to avoid burning your baby. Baby G is a lucky baby to have you as his mom. Loving your baby food recipes! Didn’t know that there some on the website. Very cool. Thanks for the recipe! Very excited to give this to my baby. What is the biggest batch you have made (how many cups of rice) and have you tried freezing this with success? Thanks again! No freezing. According to the Chinese, you don’t want to feed overnight porridge to baby as it will have “winds.” The batch is about 20 oz, good for two meals of 8 oz each. Question: Are you using dried silverfish? Is pre-soaked needed or just dump it into the pot? Yes, fried silverfish, no need to pre-soak, just rinse. Great recipe. Never know I can put onion in congee. Gonna give a try! gosh, this looks so good tt i want to be baby g too! Hi, do you pre-soak the dried scallops? oh, can give meat to baby already, at 7mths old? Great recipe. It look delicious for grown up too..
Tasty n sweet congee. However as my son’s 19 mths I would next time around reduce the cooking time to 20-30 mins so that it won’t be so smooth. Can I keep the porridge in the freezer for a few days? My baby eats very little only. Hi, thanks for the recipe! Do you use 1 whole small onion, or larger? Thanks for the recipe! One question. I read in your comments that this is good for 2 portions. Since your don’t recommend freezing, do you feed your son this for both lunch and dinner? My baby loves this! I even had some for myself coz it tastes so good!